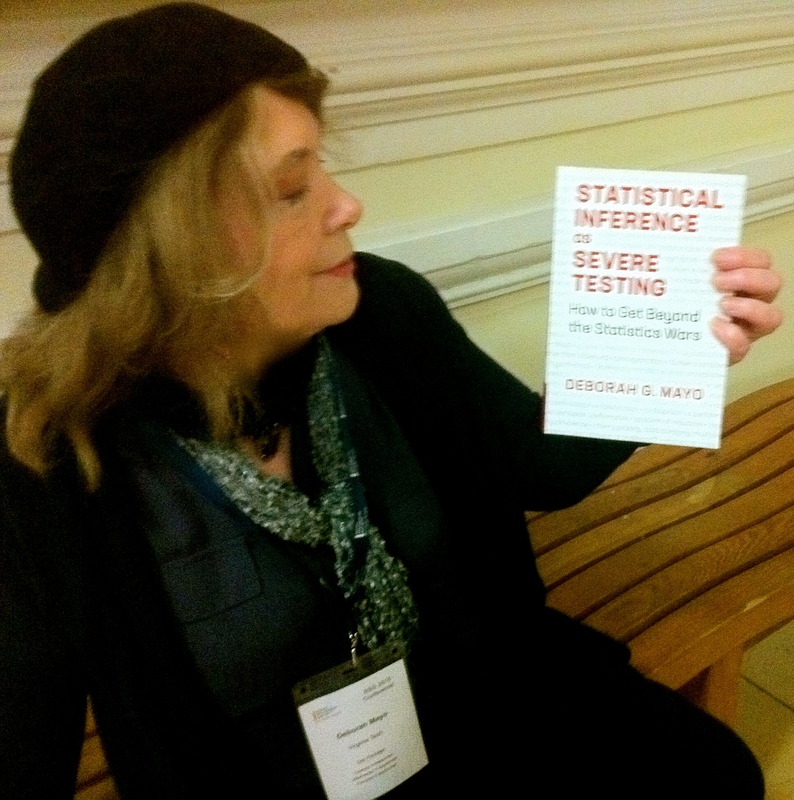 Deborah Mayo recommended that I consider coming up with a new name for the statistical methods that I used, given that the term “Bayesian” has all sorts of associations that I dislike (as discussed, for example, in section 1 of this article). I replied that I agree on Bayesian, I never liked the term and always wanted something better, but I couldn’t think of any convenient alternative. Also, I was finding that Bayesians (even the Bayesians I disagreed with) were reading my research articles, while non-Bayesians were simply ignoring them. So I thought it was best to identify with, and communicate with, those people who were willing to engage with me. More formally, I’m happy defining “Bayesian” as “using inference from the posterior distribution, p(theta|y)”. This says nothing about where the probability distributions come from (thus, no requirement to be “subjective” or “objective”) and it says nothing about the models (thus, no requirement to use the discrete models that have been favored by the Bayesian model selection crew). Based on my minimal definition, I’m as Bayesian as anyone else. He may be “as Bayesian as anyone else,” but does he really want to be as Bayesian as anyone? (slight, deliberate equivocation). As a good Popperian, I concur (with Popper), that names should not matter, but Gelman’s remarks suggest he should distinguish himself, at least philosophically[i]. As in note [iv] of my Wasserman deconstruction: “Even where Bayesian methods are usefully applied, some say ‘most of the standard philosophy of Bayes is wrong’ (Gelman and Shalizi 2012, 2 n2)”. [i] To Gelman’s credit, he is one of the few contemporary statisticians to (openly) recognize the potential value of philosophy of statistics for statistical practice! This gets to a distinction I have tried to articulate, between explaining a known effect (like looking for a known object), and searching for an unknown effect (that may well not exist). In the latter, possible effects of “selection” or searching need to be taken account of. Of course, searching for the Higgs is akin to the latter, not the former, hence the joke in the recent New Yorker cartoon. In my July 8, 2012 post “Metablog: Up and Coming,” I wrote: “I will attempt a (daring) deconstruction of Professor Wasserman’s paper[i] and at that time will invite your “U-Phils” for posting around a week after (<1000 words).” These could reflect on Wasserman’s paper and/or my deconstruction of it. See an earlier post for the way we are using “deconstructing” here. For some guides, see “so you want to do a philosophical analysis“. To make the argument that the media has a left- or right-wing, or a liberal or a conservative bias, is like asking if the problem with Al-Qaeda is: do they use too much oil in their hummus? Although it’s not altogether clear what Wasserman means by his analogy with comedian (now senator) Franken, it’s clear enough what Franken means if we follow up the quip with the next sentence in his text (which Wasserman omits): “The problem with al Qaeda is that they’re trying to kill us!” (p. 1) The rest of Franken’s opening chapter is not about al Qaeda but about bias in media. Is Particle Physics Bad Science? A quick perusal of the “Manual” on Nathan Schachtman’s legal blog shows it to be chock full of revealing points of contemporary legal statistical philosophy. The following are some excerpts, read the full blog here. I make two comments at the end. How does the new Reference Manual on Scientific Evidence (RMSE3d 2011) treat statistical significance? Inconsistently and at times incoherently. Margaret A. Berger, “The Admissibility of Expert Testimony,” in RMSE3d 11, 24 (2011). This seems rather backwards. Berger’s suggestion that inconclusive studies do not prove lack of causation seems nothing more than a tautology. And how can that tautology support the claim that inconclusive studies “therefore ” have some probative value? This is a fairly obvious logical invalid argument, or perhaps a passage badly in need of an editor. David H. Kaye and David A. Freedman, “Reference Guide on Statistics,” in RMSE3d 211, 241 (3ed 2011). Although the chapter confuses and conflates Fisher’s interpretation of p-values with Neyman’s conceptualization of hypothesis testing as a dichotomous decision procedure, this treatment is unfortunately fairly standard in introductory textbooks. Dear Reader: Over the next week, in addition to a regularly scheduled post by Professor Stephen Senn, we will be taking up two papers[i] from the contributions to the special topic: “Statistical Science and Philosophy of Science: Where Do (Should) They Meet in 2011 and Beyond?” in Rationality, Markets and Morals: Studies at the Intersection of Philosophy and Economics. 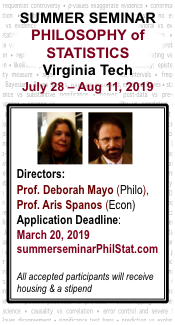 I will attempt a (daring) deconstruction of Professor Wasserman’s paper[ii] and at that time will invite your “U-Phils” for posting around a week after (<1000 words). I will be posting comments by Clark Glymour on Sir David Hendry’s paper later in the week. So you may want to study those papers in advance. P.S. Those who had laughed at me for using this old trusty typewriter were asking to borrow it last week when we lost power for 6 days and their computers were down. D. Hendry, “Empirical Economic Model Discovery and Theory Evaluation”. RMM Vol. 2, 2011, 115–145. [ii] Assuming I don’t chicken out. Sober writes “I agree that we can get rid of models that deductively entail (perhaps with the help of auxiliary assumptions) observational outcomes that do not happen. But as soon as the relation is nondeductive, is there ‘falsification’”? *See also earlier posts from the CMU workshop here and here. Elliott Sober has been writing on simplicity for a long time, so it was good to hear his latest thinking. If I understood him, he continues to endorse a comparative likelihoodist account, but he allows that, in model selection, “parsimony fights likelihood,” while, in adequate evolutionary theory, the two are thought to go hand in hand. Where it seems needed, therefore, he accepts a kind of “pluralism”. His discussion of the rival models in evolutionary theory and how they may give rise to competing likelihoods (for “tree taxonomies”) bears examination in its own right, but being in no position to accomplish this, I shall limit my remarks to the applicability of Sober’s insights (as my notes reflect them) to the philosophy of statistics and statistical evidence. 1. Comparativism: We can agree that a hypothesis is not appraised in isolation, but to say that appraisal is “contrastive” or “comparativist” is ambiguous. Error statisticians view hypothesis testing as between exhaustive hypotheses H and not-H (usually within a model), but deny that the most that can be said is that one hypothesis or model is comparatively better than another, among a group of hypotheses that is to be delineated at the outset. There’s an important difference here. The best-tested of the lot need not be well-tested! 2. Falsification: Sober made a point of saying that his account does not falsify models or hypotheses. We are to start out with all the possible models to be considered (hopefully including one that is true or approximately true), akin to the “closed universe” of standard Bayesian accounts[i], but do we not get rid of any as falsified, given data? It seems not. I see that Nathan Schachtman has had many interesting posts during the time I was away. His recent post endorses the idea of “a hierarchy of evidence”–but philosophers of “evidence-based” medicine generally question or oppose it, at least partly because of disagreement as to where to place RCTs in the hierarchy. What do people think? Litigation arising from the FDA’s refusal to approval “health claims” for foods and dietary supplements is a fertile area for disputes over the interpretation of statistical evidence. A ‘‘health claim’’ is ‘‘any claim made on the label or in labeling of a food, including a dietary supplement, that expressly or by implication … characterizes the relationship of any substance to a disease or health-related condition.’’ 21 C.F.R. § 101.14(a)(1); see also 21 U.S.C. § 343(r)(1)(A)-(B). Unlike the federal courts exercising their gatekeeping responsibility, the FDA has committed to pre-specified principles of interpretation and evaluation. By regulation, the FDA gives notice of standards for evaluating complex evidentiary displays for the ‘‘significant scientific agreement’’ required for approving a food or dietary supplement health claim. 21 C.F.R. § 101.14. SeeFDA – Guidance for Industry: Evidence-Based Review System for the Scientific Evaluation of Health Claims – Final (2009). If the FDA’s refusal to approve a health claim requires pre-specified criteria of evaluation, then we should be asking ourselves why have the federal courts failed to develop a set of criteria for evaluating health effects claims as part of its Rule 702 (“Daubert“) gatekeeping responsibilities. Why, after close to 20 years after the Supreme Court decided Daubert, can lawyers make “health claims” without having to satisfy evidence-based criteria?